End Of An Era For Gold Investors? Michael Allen recently penned an article entitled “End of an Era for Gold Investors” in which he opined that gold had probably peaked and its price would decline over the next decade. One of our readers of saw Mr. Allen’s article and was so frightened by its predictions that he considered selling all of his gold. So he sent a copy of the article to me, and asked for my opinion. To say that I disagree with Mr. Allen’s prediction is an understatement. Mr. Allen’s article has inspired some fear that I believe is unwarranted and even irrational. Say whut? In terms of inflation-adjusted dollars, today’s price of gold ($1,600) is less than half the price peak ($850) seen in A.D. 1980. That implies that today’s price of gold should at least double before we see a significant correction. 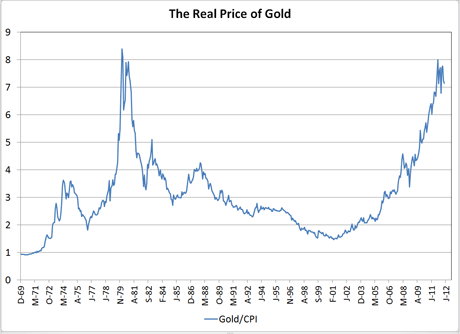 In fact, Mr. Allen does not claim gold is near its highest price based on inflation-adjusted dollars. Instead, he bases his statement on a graph comparing the price of gold to the Consumer Price Index (CPI). That’s an interesting comparison, but Mr. Allen apparently assumes that the CPI is a reliable economic indicator. I disagree with that assumption. I believe the CPI has been routinely suppressed in order to minimize cost-of-living increases for things like So-So Security. When I look at the same graph, it doesn’t tell me that the price of gold is the highest it’s been in 32 years—it tells me that the CPI has been falsely suppressed by at least 50% or more over the past 30 years, and people receiving pensions adjusted for the CPI have been persistently robbed during that time. Mr. Allen at least raises the possibility that the price of gold might fall another 82%. My response? When donkeys fly. You and I will not live to see the day when the price of gold is again below $400. As for the “many factors” that drove gold to the current heights—couldn’t they also be viewed as the “many factors” drove the dollar to its current lows? Is gold being measured in terms or dollars or are dollars being measured in terms of gold? Is gold up? Or is the fiat dollar down? The fundamental reality is not that gold is up, but that the dollar (persistently inflated by government for at least 60 years) is down and going lower. In the comparison between gold and dollars, gold is the unchanging standard. One ounce of gold 1,000 years ago, was also one ounce of gold in A.D. 1980, and is still one ounce of gold today, and will be one ounce of gold 100 years from now. The gold doesn’t change. The value of fiat dollars change. The apparent changes in the price of gold reflect the actual changes in the value of the fiat dollar. Mr. Allen apparently agrees with that interpretation since he suggests that there may be “hedging instruments” that are “cheaper and more effective” than gold. A little further on in the article, he claims to be he’s “hedging” “traditional investments” like stocks and bonds. I don’t use gold to hedge stocks or bonds. I use gold to hedge fiat dollars which I regard as certain to continue to bleed value until the fiat dollar dies. But if there are “cheaper and more effective” hedging instruments to protect us against the stock and bond depreciation, I’d like to know what they are. Derivatives, perhaps? Spanish or Greek bonds? Gold has been the only real money for thousands of years. If there’s a “cheaper and more effective hedge” against fiat dollar inflation, it must be a recent invention that has little or no historic track record. Within the next ten years, gold will probably go into the “mania phase” of most bull markets and the price might spike upward to $10,000 or even $25,000 dollars. The “mania phase” will end, and the price of gold will suddenly plummet back from $10,000 to, maybe, $5,000 . . . or it might plummet back from $25,000 to $8,000. But after gold spikes to its ultimate (and irrational) high, I believe it will “plummet” back down to a price that is almost certainly two or three times higher than it is today. If so, those who invest in gold now can expect to see their investment at least double and probably triple over the “next decade”. More, insofar as the author couches his prediction in terms of the “next decade,” he’s ignoring whatever may happen in the next 3 to 5 years. I doubt that any reasonable student of the price of gold believes that there won’t be significant profits to be made in gold over the next 3 to 5 years. After that, gold may spike irrationally and then plummet. But until that irrational spike, gold will not only provide a hedge against inflation (which our government is desperate to cause) and perhaps even against the potential collapse of the dollar—gold may provide a profit potential. I.e., if the price of gold has been artificially suppressed over the past decade, then today, the “real” price of gold on an un-manipulated (free) market might be $2,500, $3,500 or even $5,000 rather than $1,600. I believe that price manipulation is taking place but, sooner or later, that manipulation will end. When it does, all of the former price “energy” that’s been suppressed will suddenly explode and the price of gold will jump up to its true “free market” price. That jump won’t be the result of the “mania phase” in the bull market. That jump will be a reaction to ending price manipulation and represents a real “profit potential” in gold. If the price of gold has been artificially suppressed, then gold isn’t merely a hedge against inflation (a means to merely preserve your wealth against dollar depreciation)—it’s an “investment” that has a real profit potential simply because gold is currently undervalued and will inevitably rise to a true, free market price at some future date. • Second, Mr. Allen’s “traditional investments” are equities (stocks and bonds) and trading “more frequently” will generate more commissions for stock brokers. From the stock broker’s perspective, the problem with gold bugs is that they buy and hold gold. When they hold any investment, they aren’t “trading frequently” and therefore aren’t generating “more frequent commissions” for stock brokers. Gold has been the single best investment over the past decade. Nevertheless, stock brokers and investment counselors seldom promote gold because it doesn’t generate much churn. No churn, no commissions. Mr. Allen seems sympathetic to stock brokers who sees gold as a fundamental threat to their commissions and therefore dissuade people from investing in gold. If so, his article may be less investment advice than a sales pitch to buy stocks and other “traditional investments”. The subject of “value” is always subjective and debatable. But I don’t recall ever before reading anyone else’s opinion that gold has no “intrinsic value”. Physical gold is one of the few investments that has “tangible” and therefore “intrinsic” value. It’s the equities (paper debt instruments; “traditional investments”) that are mere promises to pay and have no “intrinsic value”. Mr. Allen’s comment seems incomprehensible. Mr. Allen’s assertion that there’s not even a “remote” correlation between inflation and the price is gold is absurd. I might agree that the correlation between the price of gold and government-issued inflation indexes don’t have much of a correlation, but that’s because the government routinely falsifies its reports of the current degree of inflation. Government may contend that inflation is only 2.5% while John Williams (shadowstats.com) argues that inflation is 10%. Under such circumstances, I’d tend to believe Williams’ numbers before I believed the government’s. I might also agree that the relationship between the price of gold and government-reported inflation rates doesn’t show a high correlation because the price of gold has been artificially suppressed. But it’s undeniable that there was a time when an ounce of gold was priced at $20. Since then, inflation has caused the purchasing power of the dollar to fall by about 97% and the price of gold to rise to $1600. To argue that there isn’t even a “remote” correlation between the price of gold and inflation is silly. I’ve hosted the Financial Survival radio show for years. The program always reports on a number of daily economic indicators including the price of gold and the US Dollar Index. The correlation is not absolute, but probably 90% of the time, when the US$ Index goes up, gold goes down. When gold goes up, the US$ Index goes down. There’s an undeniable “teeter-totter” correlation between the US$ Index and gold. Again, arguing that there’s no correlation between the price of gold and inflation is absurd. • The author’s recommendation that we can rely on stocks as a hedge against inflation strikes me as improbable. In A.D. 2000, the dollar (as measured on the US Dollar Index) was rated at “125”. Today, on the same Index, the dollar is running about 82. Thus, as measured on the US$ Index, inflation has caused the dollar’s purchasing power to fall by at least 34%. During that same 12 years, the Dow Jones Industrial Average rose from 10,767 to 13,096—or about 22%. That suggests that the Dow didn’t even keep up with inflation over the past 12 years. So why should anyone believe that we can rely on stocks to hedge against inflation? During the last 12 years, the price of gold rose from $275/ounce to $1605—about 480%. It’s absolutely true that the price of gold has not had a strong correlation to the government’s reported rates of inflation. The price of gold has clearly exceeded the government’s reported inflation. But does that discrepancy that the price of gold doesn’t correspond to real inflation? Or that the inflation numbers provided by government don’t correspond to real inflation? Mr. Allen apparently believes that gold is currently overpriced to an irrational degree. I believe the perceived value of the fiat dollar is currently overpriced to an irrational degree. Which argument do you believe is more probable? Admittedly, over the past 125 years, stocks have done well. But for 84 of those years (about 67% of the 125 years), the dollar was still backed by gold or silver and inflation was minimal. During an era of gold/silver based money, it should’ve been easy for stocks to generate a persistent profit. But how have stocks fared since A.D. 1971 when the dollar became a pure fiat currency? The Dow Jones Industrial Average rose from 820 (A.D. 1971) to 13,000 today—that’s an impressive increase of almost 1,500% over the past 41 years. But in the same period, gold rose from $42/ounce to $1,605—about 3,700%. Thus, since A.D. 1971, gold has outperformed the Dow by two and half times. Part of the reason the author’s 125-year analysis of “stocks-beating-inflation-by-5%-each-year” works, is that for 84 of those years, the dollar was backed by gold or silver and inflation was therefore limited or non-existent. Thus, although Mr. Allen speaks against gold, he implicitly relies on a gold-based dollar to make his 125-year analysis of stock performance seem credible. So long as the dollar was backed by gold or silver, there should’ve been little or no inflation. Therefore stocks could be expected to outperform the nearly non-existent inflation. But once we went off the gold standard, inflation rose and the stocks’ ability to outperform inflation was compromised. Once our money went off the gold standard, gold became the world’s premiere investment. Since A.D. 2,000 the price of gold is up 480% and the Dow is up 22%. If you’d invested $1,000 in the Dow in A.D. 2000, then today, the nominal value of your investment would’ve grown to $1,220. But after 34% inflation (as measured on the US $ Index), the real purchasing power of your $1,000 investment would’ve fallen to about $805 (as measured in A.D. 2000 dollars)—that’s a loss of almost 20%—hardly a “good” investment. If you’d invested $1,000 in gold in A.D. 2000, then today, the nominal price of that investment would be about $5,800. After 34% inflation, the real purchasing power of your investment would’ve grown by 280%. Over the past 12 years, has gold (up 280% in real terms) or Dow (down 20% in real terms) been the better investment? Past performance doesn’t guarantee future performance, but does anyone expect the Dow (or stocks generally) to do much better in the next 12 years than they did in the past 12? On the other hand, who doubts that the price of gold at least might increase as much in the next 12 as it did in the past 12? • Mr. Allen offers additional arguments against buying or continuing to hold gold. Some people undoubtedly found his arguments persuasive and even frightening. I view all of his arguments as flawed or even absurd. So, who should you believe? Me? Or Mr. Allen? But you could believe the world’s central banks which recently recommended that gold be elevated from a Tier II to a Tier I asset in bank reserves. The banks of the world are “officially” recognizing that gold is one of, perhaps the, premier investments on the globe. The banks of the world will increasingly buy and hold gold as a reserve asset. Gold has won the battle against fiat currencies. That’s powerful evidence that the world’s most brilliant economists and financiers believe the value of gold will continue to increase into the foreseeable future. Of course, after the world’s bankers read Mr. Allen’s article, they might change their minds. But I don’t think so—do you? Contrary to Mr. Allen’s prediction, the “Era for Gold Investors” is far from ending—in fact, it’s arguably just begun.